I had wanted a nice pair of noise cancelling headphones for some time. The undisputed champion of "noise cancelling" is Bose. At the time this was the QC15, more recently replaced by the QC25. I have tried many NC headphones, and can confirm that the noise cancelling system in these headphones is amazing. However, they are rubbish to actually listen to music on. So after trying out a bunch of headphones, I went with the PSB M4U 2s. These headphones appealed to me for many reasons. The sound out of them was excellent. They offered not only noise cancelling, but also had a built in amplifier that could be turned on without NC. The cable was removable and could be attached to either side of the headphones. They functioned as a headset. They functioned and sounded great with no battery at all (passive). And lastly, they seamed very well built. No plastic snaps but screws all over, with metal and high quality polycarbonate. If there was one downside it was the price. And really, the price was justified but I didn't want to spend $400 at the time. I managed to find them used for half that. I have enjoyed wearing these almost every day for over a year. But two weeks ago the left channel just stopped working. I contacted PSB about getting them fixed. I didn't expect warranty service because I purchased them used, but I was expecting to be able to pay to have them fixed. This proved to be false. Unlike PSBs other products, which are made right here in Ontario, Canada, their headphones are made in China. PSB informed me that they do not service out of warranty headphones. I called the two closest authorized PSB dealers, and was informed that they cannot service them because PSB does not supply parts and I should contact PSB directly. I contacted PSB again about getting parts, and they informed me that they do not provide parts. So it appears, that if you have a fault with your M4Us after the 2 year warranty has expired, you're on your own. First off, these headphones were purchased used. It's very possible that this flaw was fixed in later units. I took apart the left side of my M4Us. 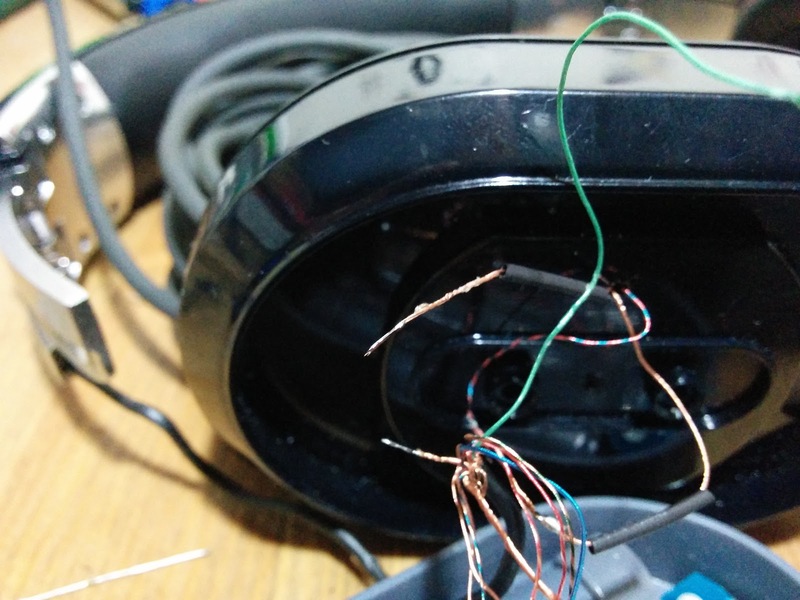 As expected, the headphones are well built using hardware instead of glue and plastic snaps. This was until I get it all apart. On the inside it was apparent that PSB chose form over function. The cable used to connect the two halves of the headphones together was wholly inadequate. It was tiny, to facilitate hiding it within the head band. I've created an image with two areas highlighted. You can see that the individual cables fray where they come out of the sheathing a 1. One of the cables for the speaker was being held by just one copper strand when I took things apart. You can see in the area marked with 2 that another wire had completely come disconnected. 2. also illustrates what I would call the main design or assembly flaw. The cable sheathing terminated right where the housing ends for the main body of the headphone earpiece. I've pulled it out to work on it, but this explains the fraying. The cables were rubbing up against the plastic here. Overall, there are 12 conductors coming in through that tiny cable. They are small and fragile. I had another 3 come off their solder joints just while trying to take the unit apart. You might also need extra cable if things are really bad. I found replacement headphone cable on Deal Extreme which I have ordered but didn't need. Take apart the headphones by fist removing the ear padding on the side that has stopped working. 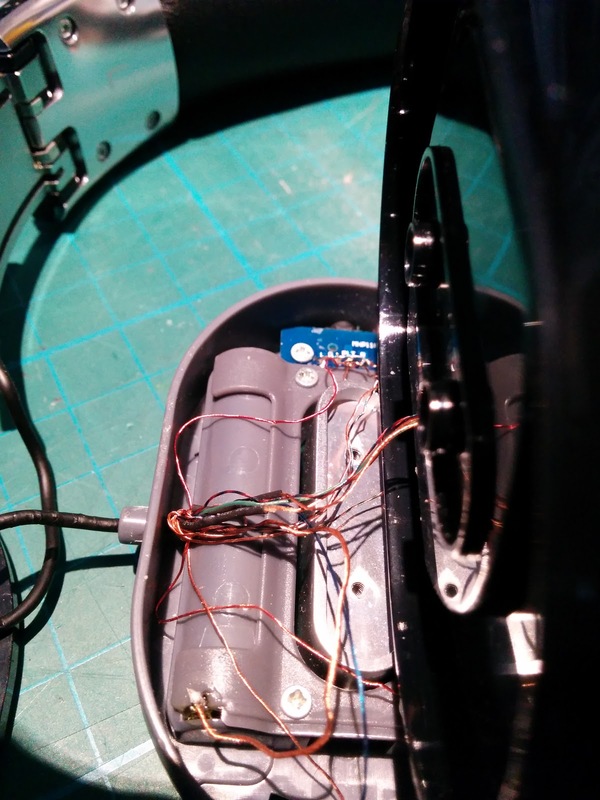 This will expose 4 Philips screws holding the speaker into place. 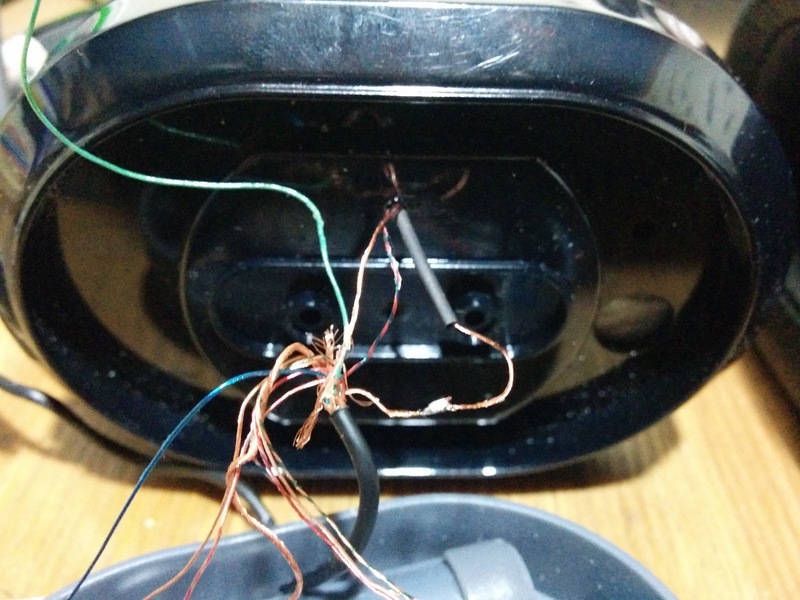 Be careful pulling the speaker housing away as there is very little slack in the cable. Twist the speaking housing to get to the two Philips screws holding the main body together. Place the speaker housing back into the cover for the main body to prevent accidentally dislodging any cables further. Again, be careful pulling this second part away as there is little slack in the cable. Use your pliers or tweezers to remove the tape holding down the wire. At this point you have enough clearance to start unscrewing the part of the headband that holds the speaker in place. This is where you need the Torx screwdriver. 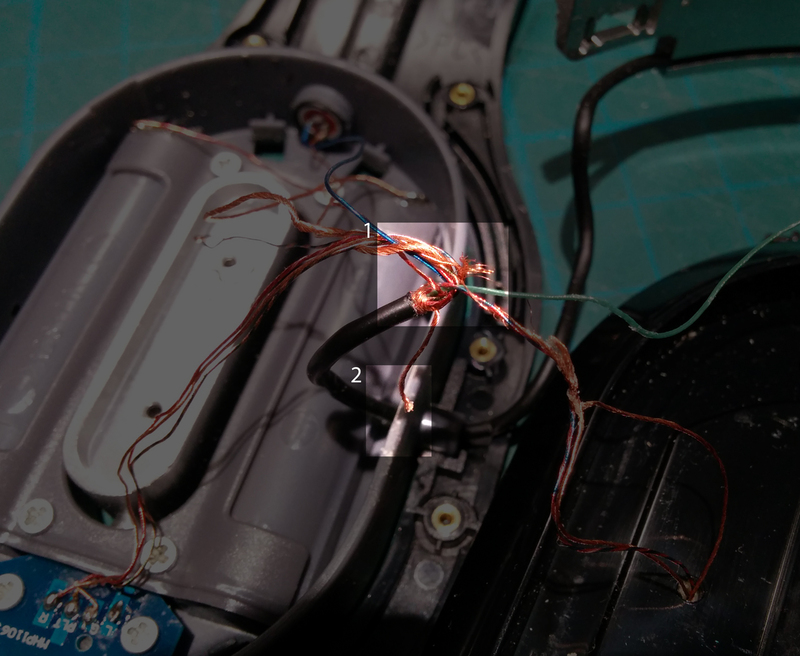 Take apart the two halves of the speaker holder, pay attention to the copper spring attached to the metal armature and remove the cable from the cable guide. Now you have slack in the main cable which will allow you to pull it into the main part of the speaker housing so that you can work. At this point I would take a photo of all the cables so that you have a reference of what goes where if something has gone wrong later. Cut away any excess wire that has frayed from any split connections. Let the joint cool sufficiently and then slide the heat shrink tubing over the connection. Tug on both ends of the cable to make sure you have a solid connection. 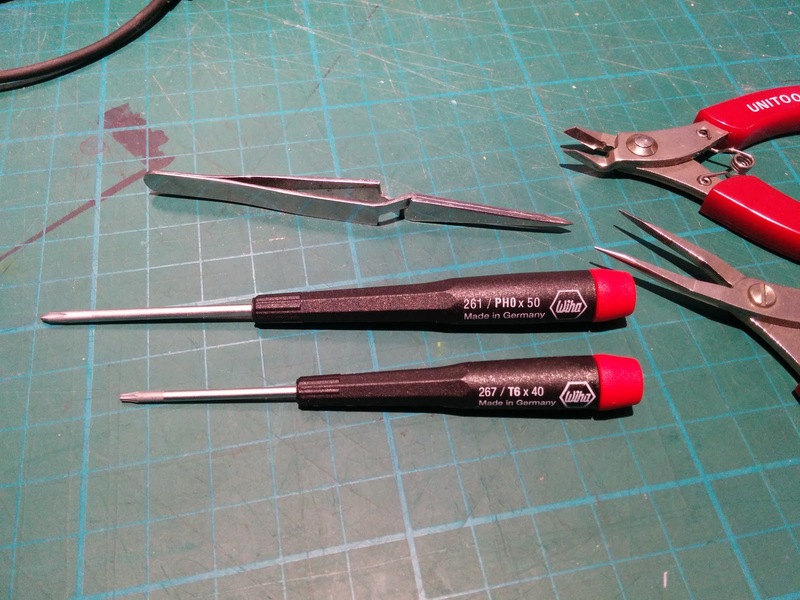 Use a heat gun or other source to shrink the tubing over the solder joint. I would also check all the other solder connections at this point and re-solder them if needed. At this point I would test the headphones by plugging in a source, putting in batteries and make sure everything works. 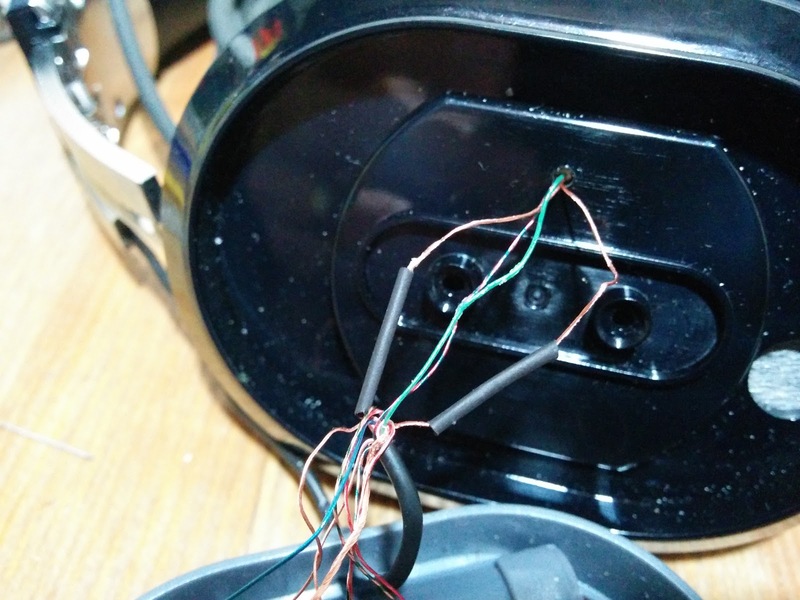 Once the test works out, pull the cable out so that only a bit of the housing is left inside the headphones. I used some electrical tape to add some buffer for further fraying. Then use more tape to hold down the cable so it doesn't get in the way of re-assembly. You now have to re-assemble the armature that holds the speaker unit. First lay out the headphone cable into the cable guide. The slack goes at the head-padding end for extension. Make sure to place the copper spring in place into the metal armature. Then re-assemble the main speaker housing in reverse of how it was taken apart. There you have it. If you have any questions feel free to comment below and I'll try to answer them. Hopefully PSB has fixed this issue in later production runs or plans to. For what is otherwise an excellent pair of headphones. Independent of this blog post, I have been in contact with PSB above. Before I published this info, I sent them a further update via their support forums about the issue that I had found. They have offered to sell me a discounted set of M4U 2s. I am taking them up on their offer. First, these are a great sounding pair of cans with great features. This will allow me to have two pairs, but more importantly, a whole spare set of parts for the one pair I really need. Amazing. Thank you for doing this. I haven't had a problem with my PSB-M4U2 yet but will print this out and have it ready for when the time comes. Thanks again for taking the time to write this for the public. No problem Robert. I'm happy to give back to the audio community with this info. I also hope this post encourages PSB to fix what is otherwise a great set of cans. I am furious. I purchased a pair of the PSB-M4U2 headphones a few years back, only to have the left side become staticky and the blow out. After nearly a year's procrastination I finally sent them off to have them repaired (free of charge except for outgoing postage). In 5 weeks time they sent me a brand new pair. Today, I encounter the same problem in these headphones. We are talking about less than 5 hours listen in total since receiving this pair. First it begins in full noise cancelling mode and then on hybrid (that's were we are now) and eventually the left side will cease to work completely (based on my previous experience with this brand/model). I only needed to search Google briefly to discover this blog. Thank you for confirming my suspicion that there must be a flaw in the design and for providing a solution. Sadly, I don't know if I am up for the task (I do not own some of the tools)... At this price point I struggle with the idea of becoming MacGyver. I wish I could simply plug & play. Does anyone have an idea if there is a way that I can replace this part? I love this headset so much and I really just want them to work again. I got to your blog because I was looking for a way to isolate the interference that the internal AMP pick up from radio frequency. Anyone else have tried to put copper tape in side/around the wiring to get rid of the interference? I came across your blog since I am looking a way to isolate the radio frequency interference that is being picked up by the internal amp. Has anyone try putting copper tape to block out the RF interference?? I have a similar problem with these headphones. While in noise cancelling mode the left becomes crackly and it's horrible. I fix lots of stuff all the time but I am hesitant about taking this repair on. Is there anywhere in Perth or other city in Australia we can trust to do the repair? I thought I'd follow up my previous post because since then I've owned BOSE Q25s for a year. Two weeks before the warranty was due to expire this set stopped working on one side. They have just been replaced by Bose. 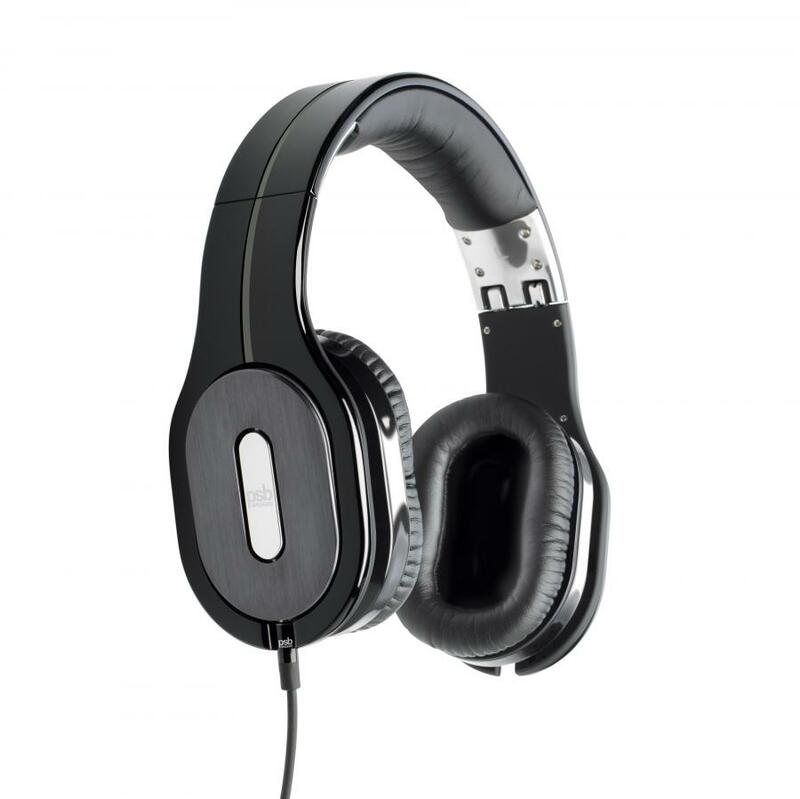 The Bose Q25s provide good sound quality but make up for that with light weight, comfort and superb noise cancelling. By far the best best for serious long distance travel and/or commuting in noisy urban environments. In contrast, the sound quality of the PSB-M4U-2 is really something. The many positive reviews are absolutely correct. The PSB's in full noise cancelling (and powered up) mode provide superb sound across base, mid-range, and treble frequencies. They create the sense of being in the room listening to music live. Above all else these headphones uniquely provide both precision and warmth (meaning a rich and lush sound). The big problem is the lack of reliability. I have had four cables fail then the headphones stopped working on one side. Yet despite this I am still considering buying a replacement set. Why? Because the sound quality makes every other set of headphones I've listened too sound sound disappointing in comparison. Before parting with the cash, however, I am going to listen to some OPPO PM-3s. As stated in an earlier comment, I had the same problem on my pair of M4U2. I followed this guide and found the same problem with the frayed wires through a rough edged hole in the plastic between 2 compartments in the left driver. I managed to fix it up and got the headphones back together but had lost some length in the cable that runs through the headband so I could no longer fully open the headband size adjuster on the left-hand side. Therefore, to make the headband the correct size for my head, I had to open the right-hand side more than the left. This was fine for about 6 months until I started to notice small hairline cracks along the full length of the headband plastic edges then one day they snapped in 2 places. On closer inspection they had snapped at weak points where the holes are to attach the (purely cosmetic) grey rubber centre trim. Had this trim not been in the design I'm sure they would never had snapped. My headphones are now 3.5 years old and I think I've had plenty of value from them but I am disappointed at these failures in the mechanical design. I work in consumer electronics and have not seen such bad cable dressing in products a quarter of the price of these M4U2s but I still love the sound of them and am willing to buy a second pair to replace my broken set. Can Paul let us know how he got on with his second pair? Did they eventually suffer the same failure? Did he open them up straight away and confirm if PSBs had addressed the cable dressing issues? Or am I mad to consider paying for another pair? They seem to have fixed the material flaw that caused the headband to crack and eventually break. The new pair I have has not shown any signs of breaking. 2nd pair of M4U 2s and second failure in left channel. Worst customer service I've ever known from PSB main site and Facebook. Thanks for fix guide, will be having a go with second pair (2015 production). Hi, I am wondering if you know of any other source for that wire. I have been searching for an alternate since I found your page last year! 12 conductor wire that is only 1.75 mm in diameter is impossible to find. I have not found a wire like that. I contact PSB and they were no help. Didn't take long to find this blog post.